If your looking to buy lol accounts for a great rate than check out Acckings amazing stock of lol accounts down below - we offer hundreds of league of legends accounts at fantastic rates. You can buy lol account for any server you want whether that's NA,EUW,RU,OCE,LAN and more. We offer dozens of payment methods when your looking to buy lol account from us. If you have any questions feel free to ask our 24/7 support team any questions you have about when you go to buy lol account. EU west | 45.2K IP | 1.1k RP | 84 Champions | 15 Skins | More! 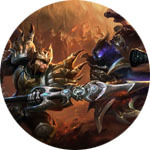 RU | 5k IP | 100+ Champs | Check it out! covered by our insurance policy occur, you will be 100% refunded for the price of your league of legends smurf. You can read more about our insurance policyshere.